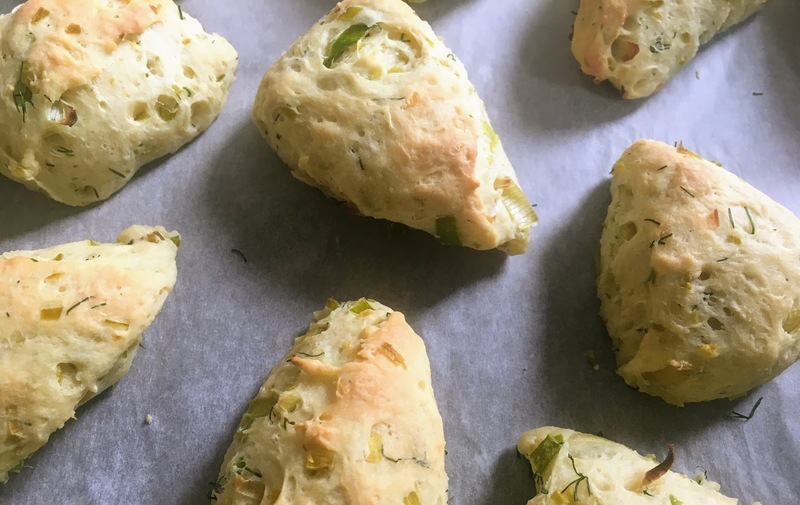 These are lighter, airier, and healthier-tasting than traditional scones, with olive oil instead of butter and Greek yogurt instead of heavy cream. 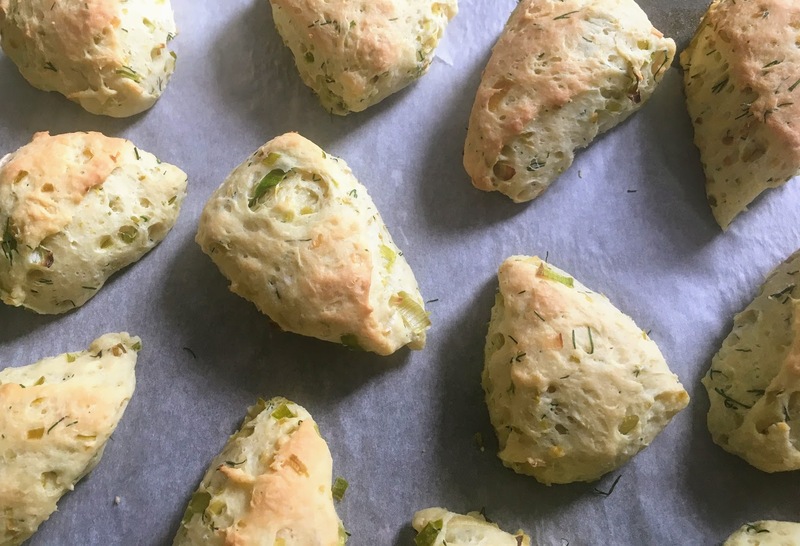 I got the inspiration from an herb, garlic, and olive oil scone recipe in The Clueless Baker by Evelyn Raab and began experimenting with different flavor combinations incorporating oil and yogurt. The flavor of leeks, fennel fronds, and feta work perfectly together. The scones are especially delicious fresh out of the oven; it’s impossible to eat just one! Saute leeks in olive oil until soft and the edges begin to turn brown, about 10-15 minutes. Set aside to cool. In a large bowl, combine flour, baking powder, salt, and black pepper. In a small bowl, mix together egg, leeks, feta, fennel, olive oil, and yogurt until smooth. Add to flour mixture and stir until a dough begins to form. Knead dough (in the bowl or on a floured surface) until smooth and elastic; it should spring back when touched. Divide dough in half. Using your hands or a rolling pin, shape each half into a 5-inch circle, and cut into eight wedges. Arrange about an inch apart on the prepared baking sheet. Bake for 17-20 minutes, until the tops just begin to turn golden brown. Store leftovers at room temperature in a ziploc bag or airtight container.